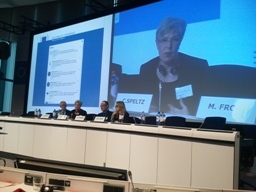 On 12 February 2014 the European Commission hosted a high level conference on the “Modernisation of the Professional Qualifications Directive: safe mobility”. The modernisation of the Directive is a priority issue for CEPI which is now taking a close interest in two of its innovations, the European Professional Card and the introduction of common training principles. CEPI President Claudine Speltz took part, along with other distinguished speakers, in the discussions and gave a detailed presentation of CEPI’s views on the common training principles which are intended to allow more professions to benefit from automatic recognition of their professional qualifications. The day long event took the form of various discussion panels. The first, on the European Professional Card, discussed the practical implications of introducing the card for interested professions and the need to engage with the Member States, and particularly the national competent authorities, which will be involved in the issue of the card. The second panel discussed the alert mechanism foreseen by the Directive for the health professions and those dealing with children together with the control of language knowledge. The third panel featured the recognition of traineeships under the Directive and the importance of diversity in education systems. Andreas Schwab MEP stressed the importance of transparency in terms of education to enable young people to choose the best options for them and to look at the strengths and weaknesses of different models. The fourth and final panel of the day discussed the common training principles. Claudine Speltz was joined by Constance le Grip MEP and Dr Romuald Krajewski President of the European Union of Medical Specialists. CEPI’s views and concerns were presented as was the need to ensure that the new common training principles can now be successfully implemented. The conference was closed by Commissioner Michel Barnier who emphasised the importance of the issues which had been discussed, and also the importance of the principle of free movement which is at the heart of the EU. It is important to be able to respond concretely to the challenges presented by economic difficulties. The European Professional Card in particular could be a concrete tool of real use to European citizens. He also emphasised that the objective of the current mutual evaluation (or transparency) exercise under the Directive concerning the access to the regulated professions is not to deregulate but to find the best balance between mobility and security. Click here to see some more pictures from the event. Click here to read the speech of Claudine Speltz on the Common Training Principles.